Midland College is accredited by the Commission on Colleges of the Southern Association of Colleges and Schools to award certificates and associate and baccalaureate degrees. In compliance with the Commission on Colleges Substantive Change Policy, new programs are reported to the Commission and necessary approvals obtained prior to bring offered. Contact the Commission on Colleges at 1866 Southern Lane, Decatur, Georgia 30033-4097 or call 404-679-4500 for questions about the accreditation of Midland College. 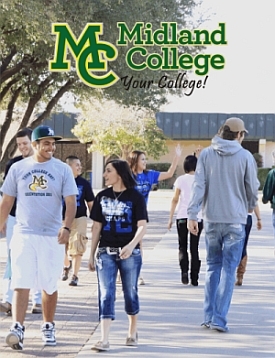 Midland College meets all guidelines and standards as set forth by the Texas Higher Education Coordinating Board. No person shall be excluded from participation in, denied the benefits of, or be subject to discrimination under any program or activity sponsored or conducted by Midland College on any basis prohibited by applicable law including, but not limited to, race, color, age, marital status, national origin, religion, gender, disability, or status as a qualified disabled veteran or Vietnam era veteran. This catalog is effective for the 2011-2012 academic school year. It is for information only and does not constitute a contract. The College reserves the right to change, modify or alter without notice all fees, charges, tuition, expenses and costs of any kind. Further, the College can add or delete without notice any course, program or policy information contained in this catalog in order to keep curriculum content and college policy current. Students can normally plan on using the curriculum in force at the time they enter for a period of four years.